All patients with cranial distortions will have a mandible that is functioning and occluding posterior to an optimal myo-trajectory. 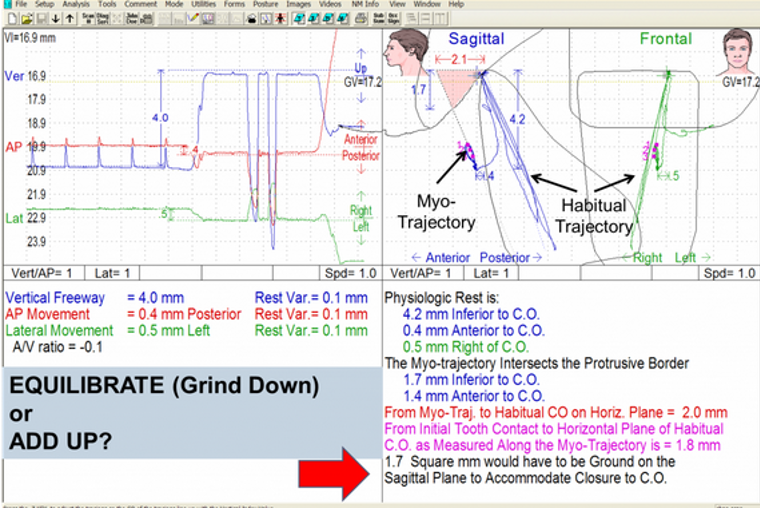 Myo-trajectory is the isotonic closure of the mandible from physiologic rest position along a trajectory through freeway space. Along this trajectory, muscles and muscle groups are firing at the minimal electrical activity to carry the mandible from physiologic rest position to terminal tooth contact. Terminal tooth contact should be balanced and synchnronized to this trajectory and not some other closing path. Once this is achieved de-rotations will then occur allowing the unraveling of the cranial skews, strains and torques. An Optimized Myo-trajectory has been recognized by the OC GNM trained dentists. They have recognized through years of clinical treatment experience that TMD patients with joint derangement, pain and masticatory dysfunctions will present with a classical “myo-trajectory” that is produced when low frequency involuntary bilateral TENS pulse stimulation is used to relax the musculature, but this is not the best and most idealized (isotonic) myo-trajectory. For this reason the OC doctors are able to use specific protocols in the use of their K7’s and J5 myomonitor TENS to identify a more accurate and specific “Optimized Myo-trajectory” for their patients mandibles which leads to a more efficient treatment resolution of these problems. 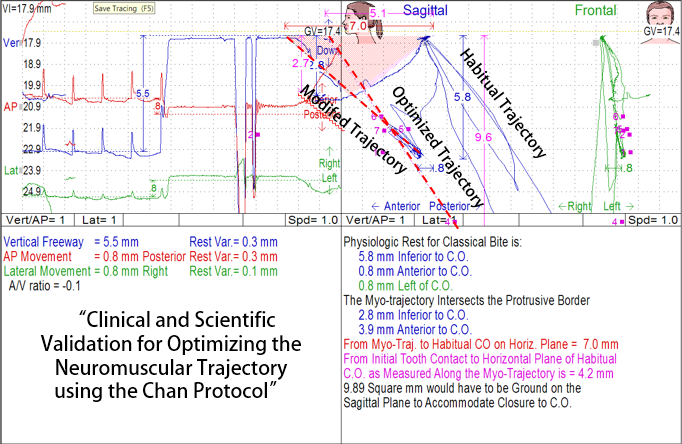 Clinical and Scientific Validation for Optimizing the Neuromuscular Trajectory Using the Chan Protocol. Chan, CA: International College of Craniomandibular Orthopedics (ICCMO) Anthology VII, 2005.